Ashqelon (also Ashkelon) was a major Philistine city located on the shore of the Mediterranean Sea. It was situated in the Philistine Plain, 32 mi. [51 km.] south of Joppa, and 12 mi. [19 km.] 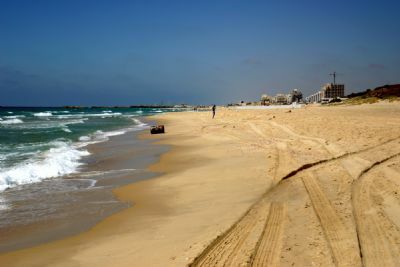 north northeast of Gaza. It is mentioned 13 times in the Old Testament. The site of Ashqelon is very large—about 150 acres [61 ha.] in size. A 1.5 mi. [2.4 km.] arc–shaped rampart and dry moat surround the site. Possibly 15,000 people lived there during its peak.